Have you been wrestling with the idea of introducing a concrete summer kitchen in your home? You this one of the best additions that you can put in your home and you should not allow anything to hold you back. You can now begin to plan about adding the outdoor concrete kitchen in your home. You have been missing on so many benefits that come with this addition in your home. It’s not only about the beautiful additions that this structure brings into your home. You can be sure that even your friends and family will enjoy having it around the house. With concrete summer kitchens, you will have all the reasons to go outside. The fall, summer, and spring weather conditions are enough motivations to get outside and catch some sun, concrete summer kitchens will give you another reason to spend some time outdoors. If you have been struggling to spend a lot of time indoors, concrete outdoor kitchen, give you an exclusive opportunity to prepare your meal outdoors. You will discover that it is so refreshing to cook in the outdoors. The heat that your cooker emits will just get lost in the environment without even you noticing. Your eyes will not be crying because of the emotions from the onions and concrete summer kitchens is a beautiful way to prepare your meals for longer. Concrete summer kitchens also add a lot of value to your home. It is one of the best ways to bring a facelift to your existing home. The truth of the material is that concrete produces one of the most durable and hygienic summer kitchens. Call a home valuer before and after installing your concrete outdoor kitchen and you will see the difference in the value addition. In fact, concrete summer kitchens are becoming a must-have item among most homebuyers in the region. Try listing your home without one and you will see the kind of bids you are going to get. The good thing is that these concrete kitchens are cheap to install but come with one of the best quality. Why not invest in one this summer! Having the concrete summer kitchen is one of the long-lasting investments you can have in your home. Concrete is known well because it has the impeccable durability that can withstand harsh weather elements and constant tear and wear. The heat of the summer and the cold conditions of winter are not going to affect this construction material. You can treat its porous nature by sealing to make it waterproof. Therefore, it will take you several years before you think about replacing your concrete summer kitchens. If you properly clean and treat your concrete surfaces, your outdoor kitchen will last for several decades. Concrete summer kitchens provide one of the best places to spend time with your friends and family. Having a kitchen outside the house means that means that you have an entertainment place for your guests and family. You can match this with the stunning and elegant look of customized and stamped concrete. 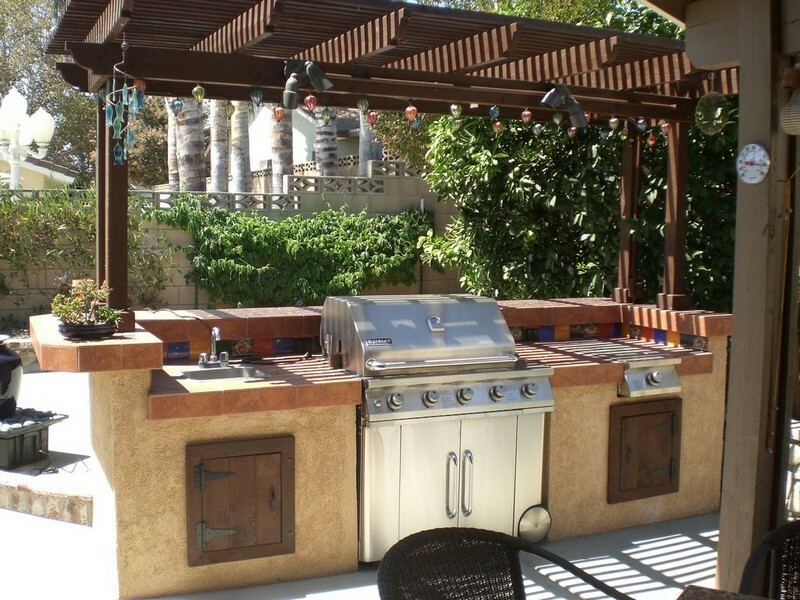 You can be sure that your outdoor kitchen will impress your guests. Don’t forget about the meal. It will also be so impressive to your guests. It comes a time when you need someplace to run away from reality. For most people, cooking helps us to relax and stay away from our day to day stress. Combining the passion for cooking with the elegance of concrete summer kitchens takes the whole experience to the next level. You will find yourself relaxing so much and getting a visually appealing escape from reality. There comes a time when you also want to spend a few hours outside your own house but within the compound. Isn’t cooking outdoors an excellent opportunity? The other benefit of concrete summer kitchen is that they add an aesthetic appeal to your home. Have you been keeping watch of the modern interior and exterior trends? If yes, then you should be knowing the best aesthetic choices that will bring value to your home. It goes without saying that concrete summer kitchens rank among the top options. Apart from relaxation and adding value, the outdoor kitchens that are manufactured from sturdy concrete are so impressive to your guests given their natural beauty. You can get in touch with http://www.customconcreteorlando.com if you want to schedule your next outdoor kitchen project.